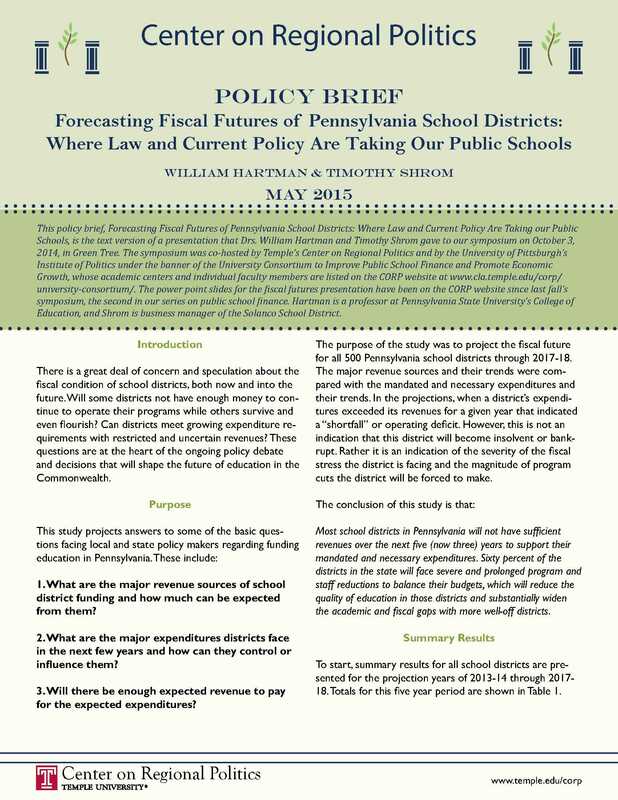 This policy brief, Forecasting Fiscal Futures of Pennsylvania School Districts: Where Law and Current Policy Are Taking our Public Schools, is the text version of a presentation that Drs. William Hartman and Timothy Shrom gave to our symposium on October 3, 2014, in Green Tree. The symposium was co-hosted by Temple’s Center on Regional Politics and by the University of Pittsburgh’s Institute of Politics under the banner of the University Consortium to Improve Public School Finance and Promote Economic Growth, whose academic centers and individual faculty members are listed on the CORP website at www.cla.temple.edu/corp/ university-consortium/. The power point slides for the fiscal futures presentation have been on the CORP website since last fall’s symposium, the second in our series on public school finance. Hartman is a professor at Pennsylvania State University’s College of Education, and Shrom is business manager of the Solanco School District.